Lady Bunny Blog: ANOTHER OIL SPILL! It's a new year, but one thing hasn't changed: Shell still can't be trusted to drill safely in America's Arctic. 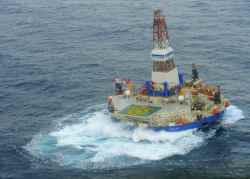 On New Year's Day, a Shell Oil rig, carrying over 150,000 gallons of petroleum products, broke free from its tugboat and ran aground near Kodiak Island, Alaska. This is the last straw after a long string of failures. Tell President Obama to immediately cancel Shell's drilling permits before it's too late. Last year, Shell came close to drilling for oil in the Chukchi and Beaufort Seas - also known as the Polar Bear Seas because they are home to 20% of the world's polar bear population. But Shell showed it was completely unprepared for the reality of the stormy waters of the Arctic Ocean. Shell’s ships caught fire, the spill clean-up equipment was destroyed during testing, and at the last minute, Shell admitted it wouldn't be able to comply with its clean air permits. But this most recent incident is the last straw. The Polar Bear Seas are far too important and fragile to leave in the hands of Big Oil. They are home to walrus, endangered ice seals, hundreds of species of migratory birds, and bowhead and beluga whales. Shell’s incompetence could lead to an irreversible disaster. Tell President Obama: we can't trust Shell in America's Arctic. Last year, millions of comments from people like you stopped Shell's plans to drill in the Arctic, and we can stop Shell again this year.